4 Where did my sweetheart hide? 6 How long will you keep me waiting? 7 Who plays the flute? 12 Is she a stranger, the one you hurt? What Melody Is My Veena Playing? 1 What Melody Is My Veena Playing? 3 All has vanished, Oh, Where is She, here is She? 14 I will not bewitch you with beauty, but with love. 6 When Will I See You Again? This was a journey that followed diverse paths, ultimately leading to the same destination as all journeys: ‘fulfilment’. This journey, assisted by the Australia Council and ArtsSA, began in February 2006, in a Studio, ‘Audio Art’, in Dhaka, Bangladesh. It reached its conclusion in May 2010, in a Studio in Adelaide, ‘Q, The Music’. The project objectives were to produce a CD of original interpretations of timeless classic compositions and folk songs of Bangladesh, blending North Indian and Western Music systems. Originality in my mind translates into pushing boundaries and expanding mental horizons. My selection of songs was influenced by audience accessibility combined with my own need for musical challenges and experimental windows. The reason for the diversity in time and place is material for a short story. Briefly, health reasons led to the delay of the project, which in turn led to the diversity in musical arrangements. My gratitude to the Australia Council and ArtsSA for pushing their boundaries as well, in order to accommodate the unplanned slowing down of the project. The upside of the delay was maturity of the concepts and unexpected meeting of musical minds, with magical outcomes. Akhter Jahan: Artistic Director/Musical Arranger, Producer, Lead Singer, Vocal Supports, Tanpura, Shoormondol, Ghungur (Ankle bells), Shakers. Quentin Eyers: Studio Director/Engineer, Co-Musical Arranger, Assistant Producer; Multi-Instrumentalist: Guitar: (classical, steel string, 12 string, slide); Fretless Bass, Dulcima, Mandolin, Piano, brushes, cymbals, virtual Dilruba, Dotara, Vocal Support, Didgerido. Azad Mintu: Co-ordinator, Dhaka Musicians. Badshah: Sound Engineer, Audio Art. Rob Transini: Sound Engineer, Industry Studio. Modhumita Biswas, Rima Rakshit, Priya Ghoshal. Price: $20.00 plus $2.00 for postage handling. 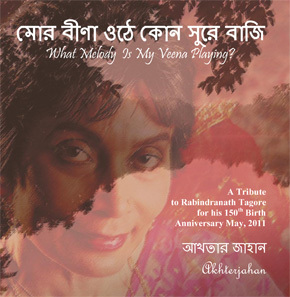 This is Akhter's 2003 Album, "Sharthok Johnom Ahmaar" (Blessed is my Life), with songs of Tagore (Robindronath Thakur, one of the Cultural Icons of Bengal, and a Nobel Prize Winner). The songs are based on rich lyrics of patriotism and love. This album is for lovers of pure sounds. This album is for lovers of pure sounds. The style of singing and instrumental arrangements on this album are very traditional, all recorded in Bangladesh, with some extra instruments and digital effects added in Adelaide. The CD is a compilation of Radio and LP recordings done over the years. "The enthralling contour of Akhter’s life is woven into a wonderfully complex yet contemplative montage of pieces. 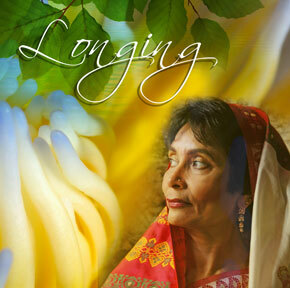 Where to bond between the performers, her voice and the sense of place and journey are captivating. I found myself transported by this CD. I think the gesture is intentional as the playing is fulsome, precise and riddled with a presence. 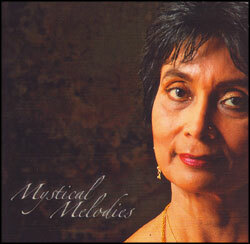 There is a contented longing in this music, nothing overdone and yet gently compelling. Trained in East and West Pakistan classical Indian music Akhter has a wonderful range and control that fathoms the complex labyrinth of musical lines. The listener can easily side-step the issue of language because the sense of passage and narrative in each “song” is so clear. There are current tones and sounds, which lift the arrangements at the right moment. 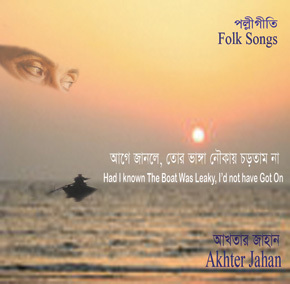 David Kotlowy has sensed the mood of Akhter's music and his guitar playing shows beautiful empathy. This CD represents an intensely emotional collaboration of 15 years, which reveals a culture, a literature, and a great voice within the haunting mystery of a soul seeking to sing its home in a new land." Price: $8.00+$2.00 for postage handling.